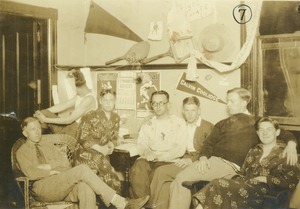 Several men gather in a dormitory room in North College. The calendar on the wall is turned to May 1925, and a football poster next to it is for a Williams College - Amherst College football game. 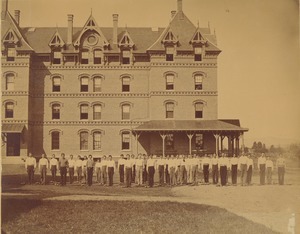 Handwritten note on back reads: "North College Bullfest". Tiny print at top of photo reads "1928 - Albert C. Cook", a reference to Albert Cairnes Cook, Class of 1928. 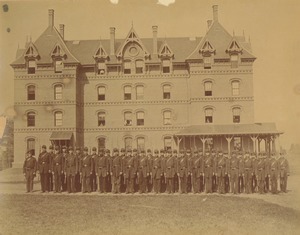 Members of the first class of the Massachusetts Agricultural College pose in militia uniform in front of the original North College dormitory. 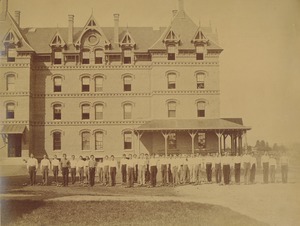 Handwritten notes on back read,"Presented by Wilson M. Tucker '71" and "see article on uniform in Aggie Life I. 75 - claims no cap & dress coat until 1875".